One of the joys of reading any Arthur Conan Doyle Sherlock Holmes mystery is their settings. It is unlikely Doyle’s purpose was ever to offer an historical travelogue but nonetheless we are given such in each and every tale. 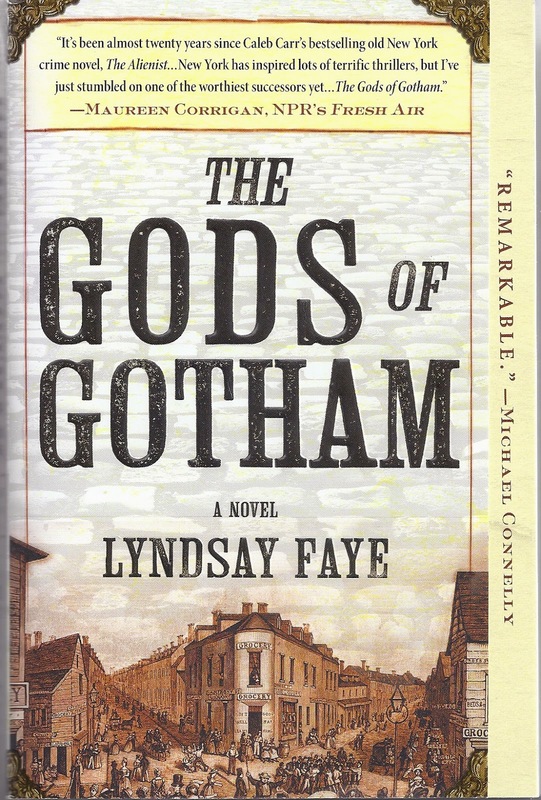 Whereas Lyndsay Faye, following in Doyle’s footsteps, which she does incredibly well in “The Gods of Gotham,” is decidedly intent on showing us the astounding world of New York City in the nineteenth century. The burgeoning metropolis on the Hudson is as much a character in this epic saga as its struggling inhabitants battling to eke out a living from day to day against overwhelming odds. Timothy Wilde and his older brother, Valentine, are the orphaned sons of two Irish immigrants. Val works as a firefighter and is active in the Irish Democratic Party while Tim manages a bar and is saving his money to propose to Miss Mercy Underhill, the daughter of a protestant minister he has grown up loving. When a horrible fire destroys both his business establishment and his apartment building, Tim is suddenly destitute without a penny to his name. Without conferring with him, Val enlists them both into the newly formed New York Police Department being assembled by Judge George Washington Matsell. Like all good historical novels, fiction and fact have to work together smoothly and the birth of the New York Police is deftly handled here as it depicts the aversion to its creation by New Yorkers who saw it as just another gang in a city riddled with such. Tim begrudgingly accepts his “copper star” until something better can come along. Then one night he bumps into a runaway child prostitute covered in blood. It is she who tells him of a mysterious black-cloaked man responsible for the murder and mutilation of over a dozen children; all of them employed at various brothels throughout the city. All of which leads to the discovery of a gruesome gravesite in the woods north of Twenty-third Street. As these events come to light, Matsell sees in Tim a moral stubbornness in his desire to pursue the case while at the same time exhibiting a keen mind for puzzle-solving; the type of skills required in this post-crime situation. Tim, much to his own surprise, is becoming a detective; a role that will lead him down the dark, depraved alleys of the human psyche. “The Gods of Gotham,” is a truly remarkable writing achievement. It would not surprise this reviewer if Lyndsay Faye did not have a working time-machine hidden in her New York apartment as the scenes she describes are so brilliantly real. In every sense they transport the reader back to a world that, until now, only existed in dusty museums. She brings that past to life and in doing so enriches us all. One of our favorite books of last year was “The Six-Gun Tarot,” by R.S. Belcher which we reviewed at that time as one of the most original, audacious weird western novels ever written. Now comes its sequel and we totally need to find new, better adjectives worthy of this amazing follow up tale of the most haunted town on the frontier, Golgotha, Nevada. The Mormon mayor possesses a magical sword and golden armor left to his father by the Prophet John Smith. The richest man in town, Malachi Bick, is a fallen angel. 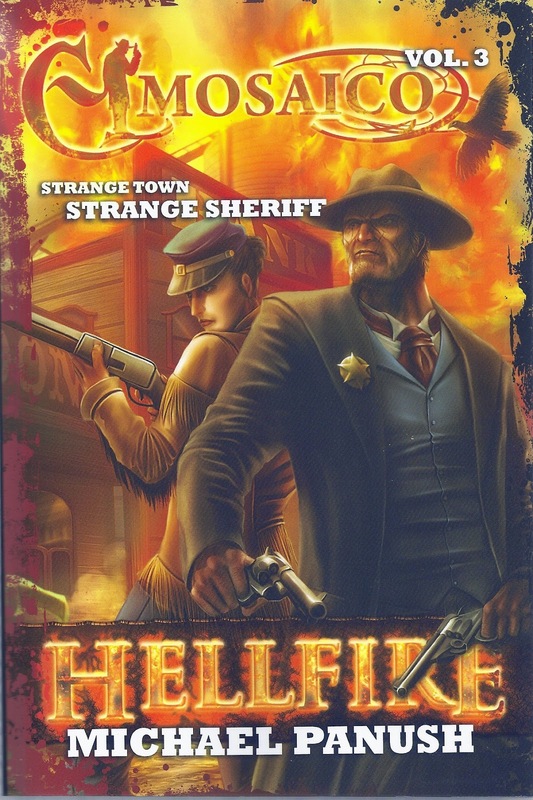 The Sheriff, Jon Hightower, was once hanged; it didn’t take and now is considered some kind of immortal whereas his chief deputy is a shape-shifting half-breed named Mutt. 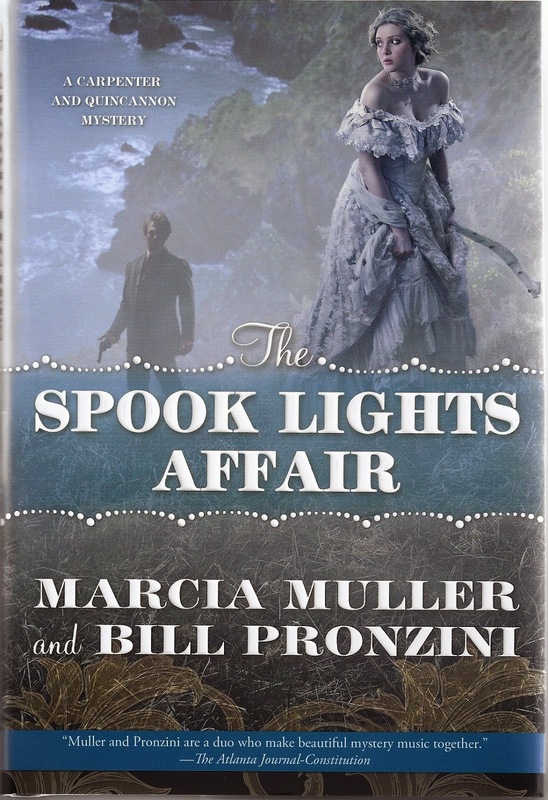 The widow Maude Stapleton is the three times grand-daughter of the pirate queen, Ann Boney and the town blacksmith, Clay Turlough is a frustrated scientist attempting to raise the dead with the blood from unholy worms. These are but a handful Golgotha’s colorful citizenry. There are many more, all of whom eventually play a role in the story’s central plot. Raziel, another fallen angel calling himself Ray Ziel, has come to Golgotha to find the skull of the first mortal ever murdered. Within this aged relic has been imprisoned the essence of destruction. Should the skull be destroyed then this malevolent spirit would be released and infect all humans; turning them into mindless creatures of death. This is Raziel’s goal and to achieve it he sends out an ethereal call throughout the world calling only the most savage, cruel, monstrous people to heed his summons and come to Golgotha. 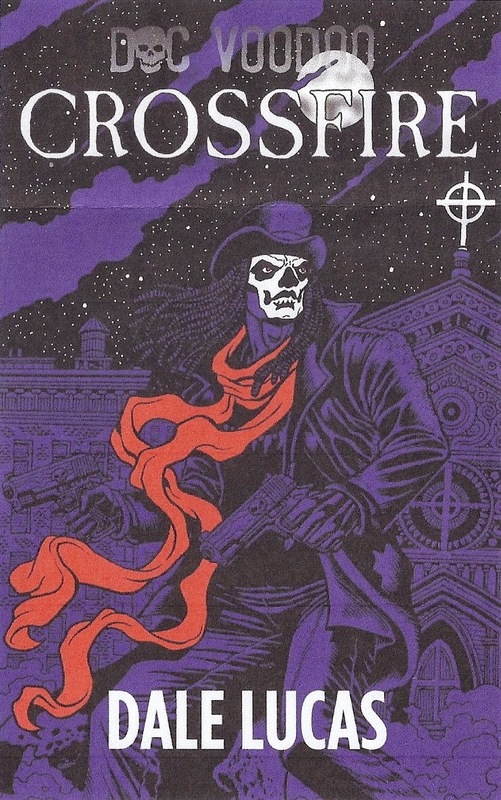 Thus Bick must ally himself with Sheriff Hightower and his supernaturally gifted associates in finding a way to battle Raziel and defeat his army of butchers before they can lay waste to the town and capture its treasure, the possessed skull. 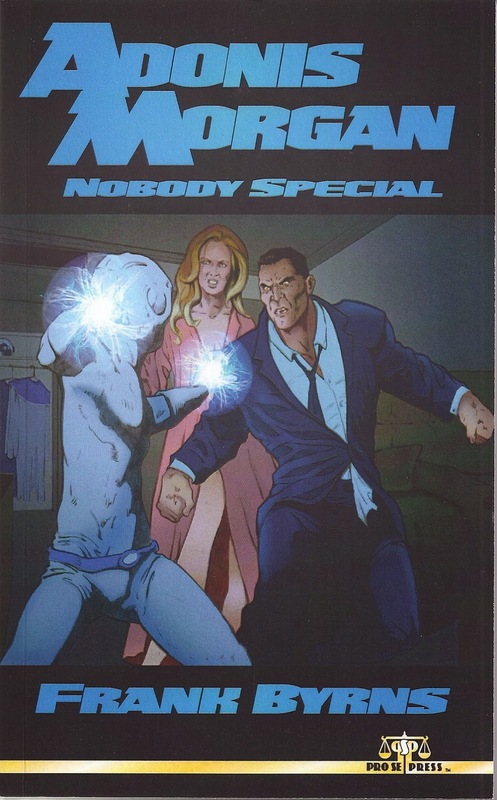 The action never lets up for a second and Belcher juggles all his wonderful characters with a master’s touch, allowing each ample time with their various subplots while moving the main narrative forward. 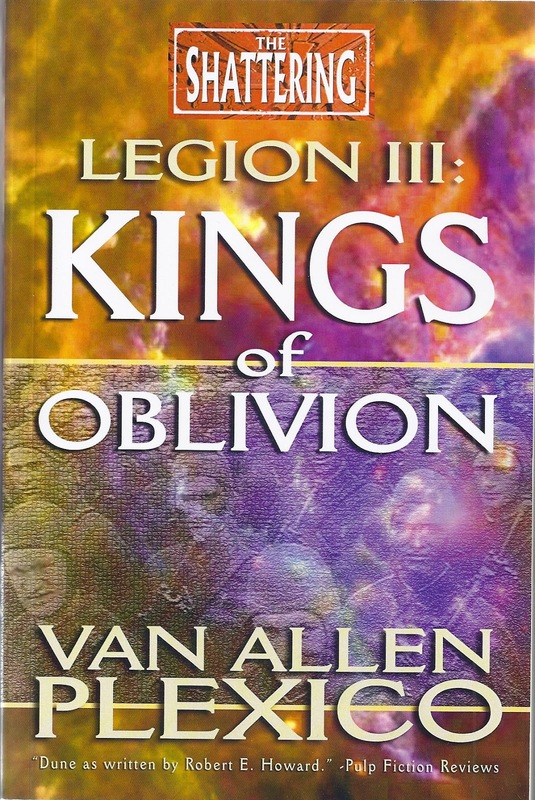 It is an unrelenting pace and the suspense mounts rapidly until upon reaching the final battle between good and evil, the reader is transfixed; mesmerized in such a skillful way unable to stop until the final page has been devoured. Weird westerns are easily one of the most popular genres of new pulps today and no one writes them better than R.S. Belcher. 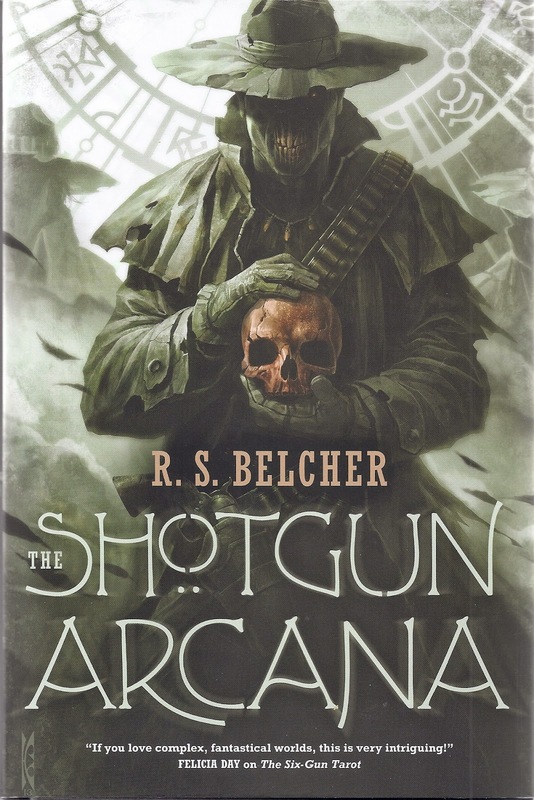 “The Shotgun Arcana” is a fantastic book lovers of the macabre are going to applaud long and hard. Miss this one to your regret. 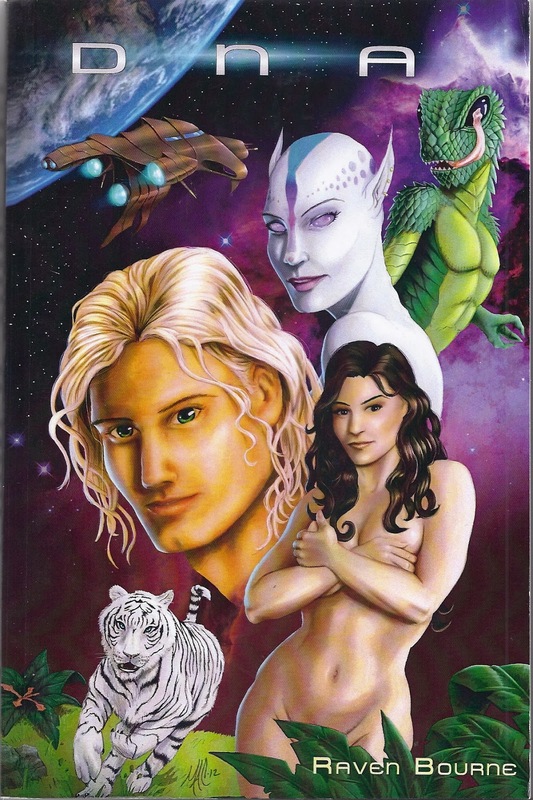 Earlier in the year we saw the cover to this anthology and were greatly intrigued by it. Till then we had never head of Doctor Omega. 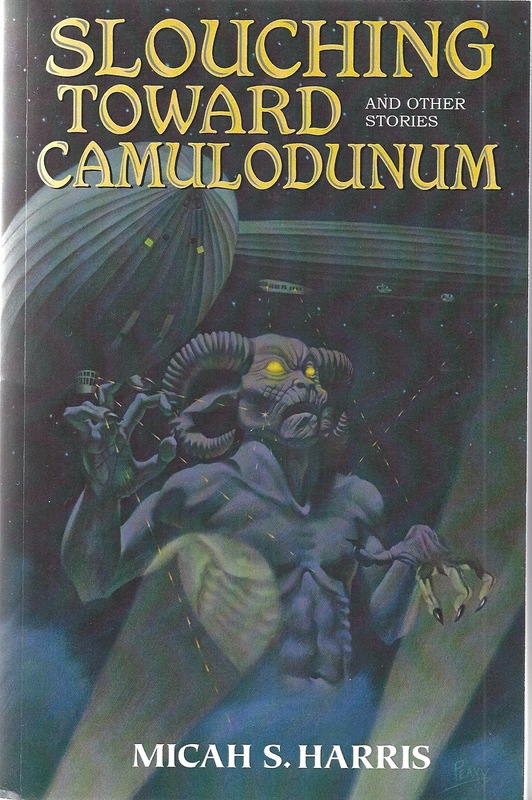 This was obviously a sequel of sorts to the book “Doctor Omega” by Arnould Galopin that Black Coat Press had published several years ago. Then, much to our delight, our good friend, Lucas Garrett provided us with a copy of that old French science fiction adventure thus familiarizing us with this hero. We read the book; enjoyed it immensely and wrote up an enthusiastic review in which we noted many of the similarities between Doctor Omega and another highly popular Doctor, this one of British origins on the telly. Then we happily went out and bought a copy of this title. It is a collection of thirteen brand new Doctor Omega stories as penned by some of the best writers in the New Pulp field today; from G.L. Gick, Chris Roberson, Stuart Shiffman and Matthew Baugh to name a few. Let me add that every story in this volume is excellent, though they vary in theme and length considerably, there is in each a spark of gleeful imagination and twisted perspectives on daring-do. From wonky vampires to cowboy heroes, Prof. Moriarity and the Bride of Frankenstein, the good Doctor’s adventures are peppered with classic fictional characters easily recognizable and handled with deft interpretations. And though it seems unfair to single out one particular entry, we must applaud the fateful meeting between Omega’s ship the Cosmos and a tiny little craft from the planet Krypton. You can pretty much figure out what happens next. 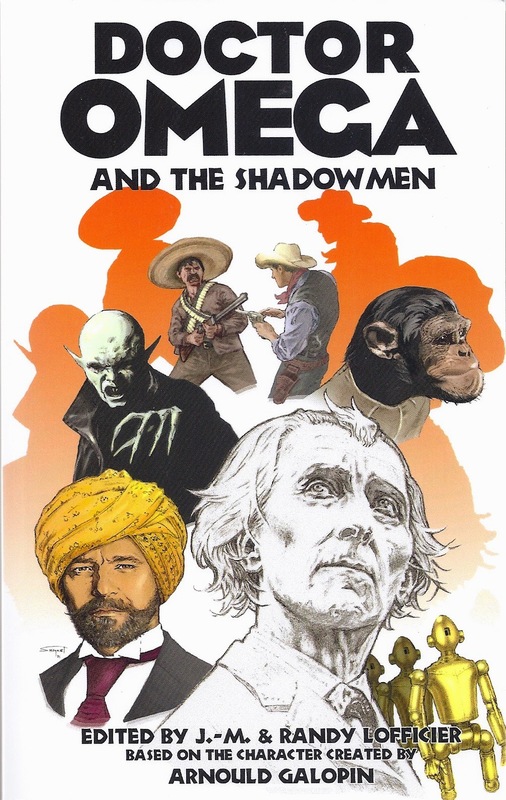 “Doctor Omega and the Shadowmen” is one of the best anthologies released this year and it is guaranteed to entertain fans of the fantastic. Do yourselves a big favor and pick up copy. You can thank us later. 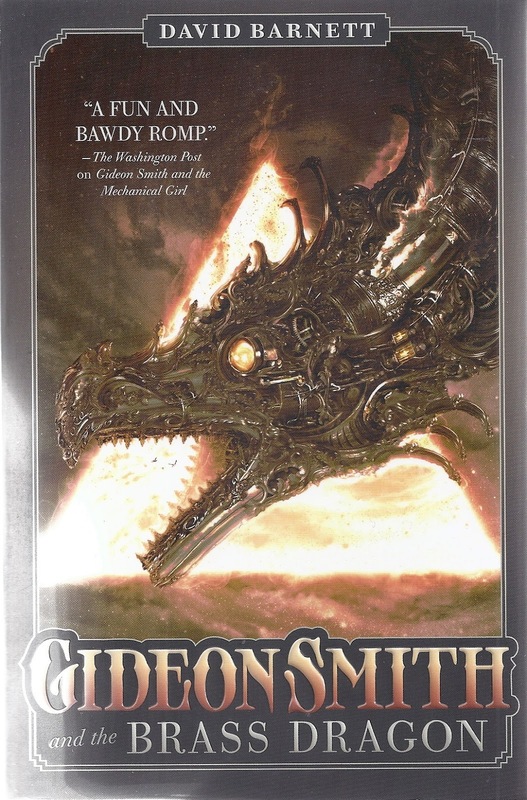 Last year we discovered a truly marvelous steampunk title, “Gideon Smith and the Mechanical Girl,” by David Barnett. It was so audacious in its alternate-steam world presentation mixing original characters with figures from various literary classics. It was such a joy to read, we nominated it for Best Pulp Novel of that year and, as with all fun reads, we fervently hoped that Barnett would grace us with a sequel. That he has is a cause of much celebration and proving himself a genuine fantasy adventure master, he delivers a follow-up tale twice as grand as its predecessor. It is months since the events chronicled in the first book a young Gideon Smith, the native of a small fishing village, has been named the Hero of the Empire by the Queen and has become an agent of the Foreign Service. Accompanying him on his adventures is the corpulent journalist, Aloysius Bent, and the lovely airship captain, Ms Rowena Fanshawe. 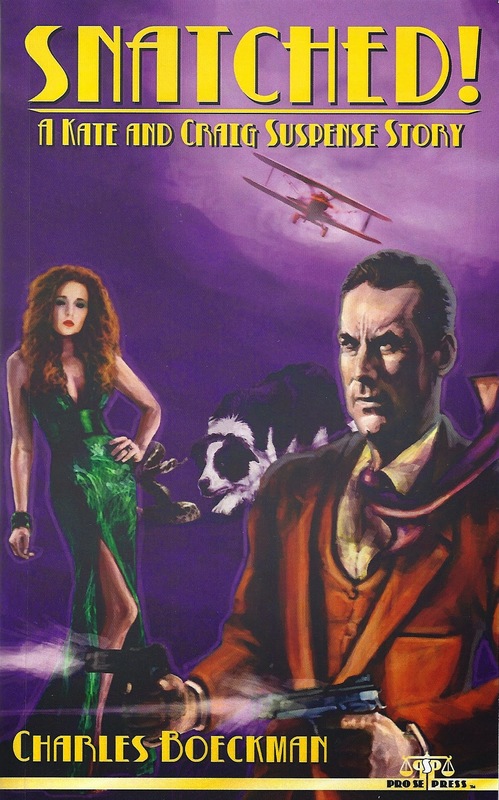 After returning from an assignment in the South Pacific, they are ordered to British America to retrieve Apep; the mechanical dragon stolen by the Texas outlaw Louis Cockayne along with Maria, the clockwork girl. 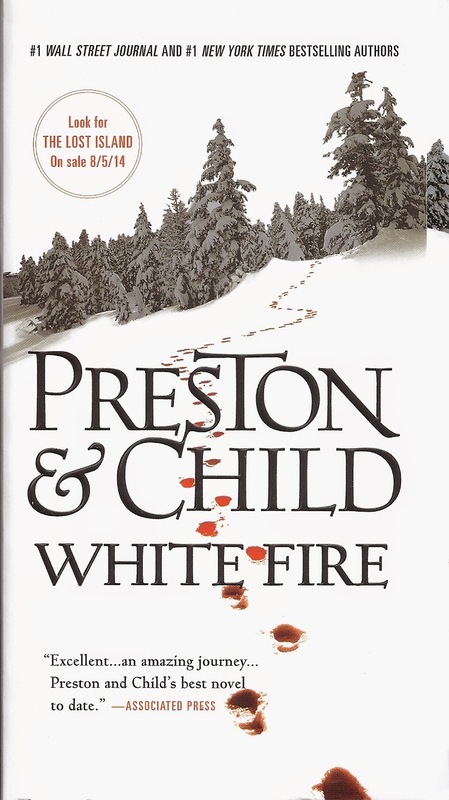 This is a personal mission to Smith as he has fallen in love with Maria and is determined to rescue her from Cockayne. But this America is primarily an untamed land with only its coastlines having been settled; the British in the east, the Japanese in the west and the Spanish to the south. Upon their arrival in New York, they learn that Cockayne is hiding in the free Texas town of San Antonio now called Steamtown and run by Thaddeus Pinch; a cyborg gunfirghter named more machine than man. Pinch is a sadistic fiend who operates the coal mines of Steamtown through the pain and suffering of hundreds of kidnapped slaves. To save Maria and retrieve the Brass Dragon, Gideon and his friends have to battle a private army of cutthroat mercenaries and battle a prehistoric monster. But as in their first adventure, they manage to recruit new allies among which are a genius Japanese inventor, an immortal freedom fighter known as Nameless and a beautiful Zorro-like senorita whose prowess with a rapier is deadly. The action is non-stop, the locales both familiar and strange and all of it populated by some of the most colorful characters ever put down on paper. “Gideon Smith and the Brass Dragon” is a rollicking adventure and for David Barnett’s second winner in a row. We can only wonder what he has up his imaginary sleeve for book number three. I have a particular fondness for stories that pair historical figures together in fictional adventures. These people actually lived during the same time but in reality never met, ergo the wish-fulfillment element in this kind of what-if story. That’s what Loren D. Estleman has done with “Ragtime Cowboys” and it works to perfection. As unlikely as it seems, both Charlie Siringo and Dashiell Hammett did have several things in common; both worked for the famous Pinkerton Detective Agency at one time and both later went on to become published writers. Siringo was recognized more for his illustrious lawman career which had him rubbing elbows with the likes of Billy the Kid, Pat Garrett and Butch Cassidy and his whole in the wall gang. There have been scores of books and films about his life and career securely guaranteeing his place in western cowboy history. Hammett on the other hand would gain renown for his literary achievements giving the mystery world such classic personages such as Sam Spade and Nick and Nora Charles. Thus they were karmic opposites, one famous for his real exploits, the other for his fictional creativity. And so Estlemen brings them together in 1921 California. The tale begins in Los Angeles where a senior Siringo is attempting to write another book about his colorful past. He is visited by an aged Wyatt Earp. Earp owns a horse ranch and one of his prized racing horses has been stolen. He hires his Siringo to find and retrieve it. The only clue they have is the suspected thief has just been hired to work for the widow of Jack London on her spread in the hills beyond San Francisco. 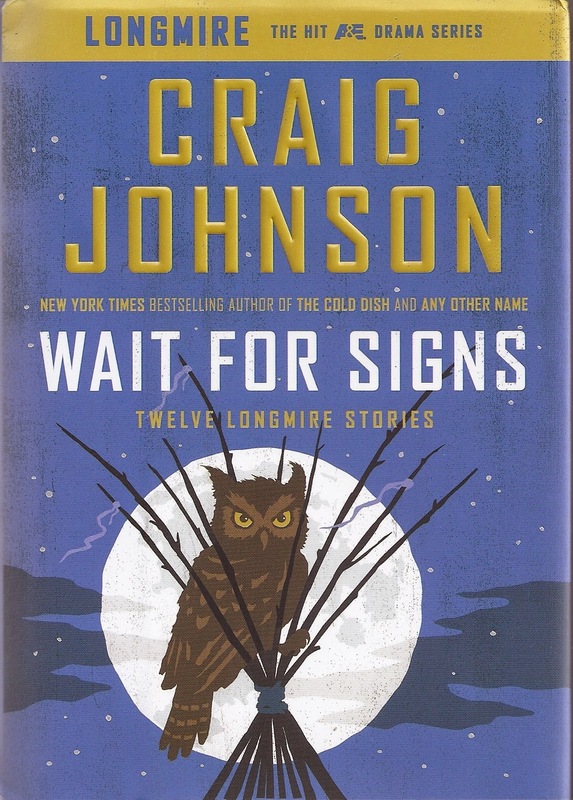 Earp sends Siringo to Frisco where he is met by a young man also a former Pinkerton veteran who will act as his guide and aide; one Dashiell Hammett. The dialogue between Siringo and Hammett is brilliant and hilarious. While Siringo was a staunch Republican who despised socialist of every ilk, Hammett was an avowed liberal who never missed a chance to criticize the noveau American rich gentry. From the second they meet, the sparks fly and it is only through their trials together that they ultimately come to respect each other’s grit and strength of character. How that mutual respect evolves is the true beauty of this cowboy fable. Oh, there’s also an underpinning plot of political corruptions wherein our two ragtime cowboys get mixed up with the Teapot Dome Scandal. This was a bribery incident that took place between 1920 and 1923 during the administration of President Warding Harding which ultimately led to the Secretary of the Interior, Albert Fall becoming the first Cabinet member to go prison. The entire plot is a nothing but a flimsy gimmick with which to bring Siringo and Hammett together against an authentic historical event. Its revelations at the book’s climax are superfluous and easily forgotten. What is not is the shoot-out at the London ranch and both Siringo and Hammett reliving their raucous rowdy youthful escapades one last time. 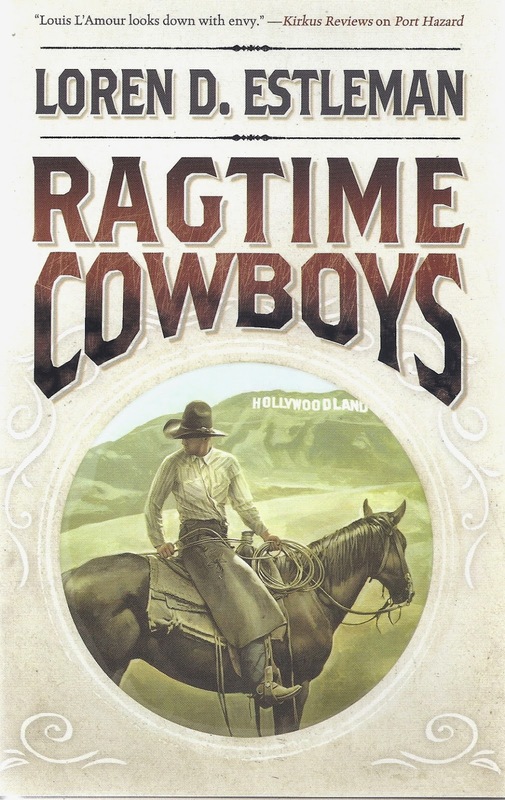 “Ragtime Cowboys,” is an insightful look into America’s past through the eyes of two remarkable men, both of product of their times. It is one of the most enjoyable books I’ve ever read. No baseball player hits a homerun every time at bat. Nor does every writer produce a must-read thriller with each new book he or she releases. I’ve made no secret in this column that I am huge fan of pulp writer Charles Boeckman and the fact that he is still writing in his 90s continues to both astound and inspire me. 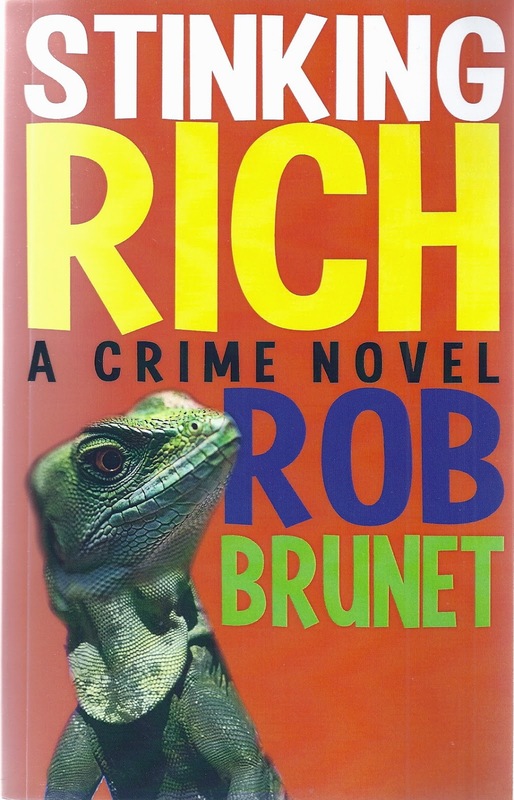 Sadly, with his latest book he goes off into a multi-plotted ditch with no clear cut finale. In fact, the book is divided into two very distinct parts as if it had been originally intended to be presented as two separate shorter pieces. In the first half we meet our protagonist, private eyes Kate McHaney and her alcoholic musician ex-husband, Craig Dawson. We’re given brief background histories of both; a reader’s digest encapsulation of their all too brief union and then the mystery begins. The mayor’s teenage daughter has been kidnapped and it is suspected the culprit was a local mob boss with connections to the Mafia. McHaney and Dawson are hired by the mayor and ultimately discover the real bad guys and in a climatic shootout in some arid Texas scrubland, rescue the young lady. Now had the book ended there, we’d be applauding loudly and singing its praises. But it does not and what we are then presented with are a series of interconnected vignettes regarding the gangland boss which all manage to involve our heroes in one fashion or another. The old mayor has retired and the mobster is campaigning to replace him. Somehow Craig is recruited to run against him. Then the two private eyes become the guardians of a young orphan whose father, a convicted drug-dealer, was murdered. Soon thereafter the boy comes to Kate asking her help in finding a missing Mexican girl here in the U.S. illegally. Which then puts the lovely detective in the crosshairs of the Mafia kingpin and days prior to the big election, Dawson disappears. If this all sounds confusing, it is and it isn’t. It is not difficult to follow because Charles Boeckman is the consummate writing professional and his technical skills are exemplary. The reader has no problem following along with his tale. The problem is that narrative goes nowhere and by the end of the book there are no concrete resolutions to any of these plot threads. The book is billed as the first in a series and so it is safe to assume Boeckman will pick up on these dangling plots in his next volume. All well and good if the reader is fortunate enough to find the next book. 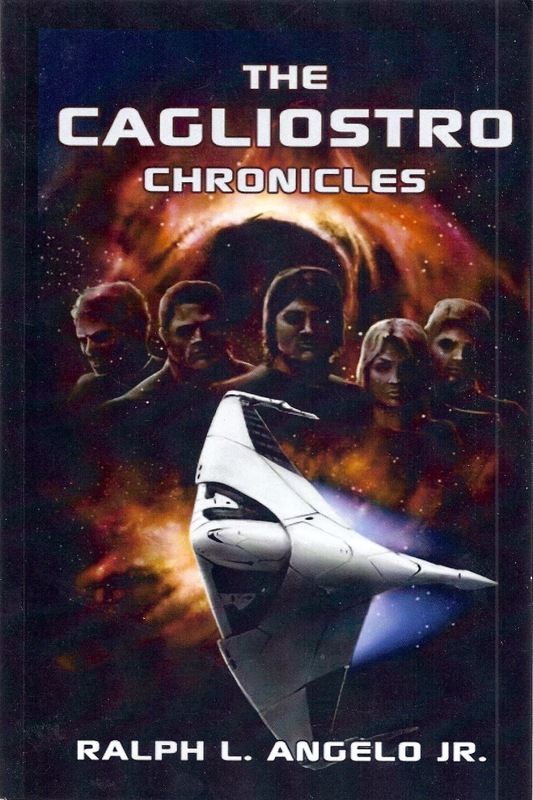 But even in a series, each chapter should be somewhat self-contained and close out on a genuine climax that does not require having to wait for a sequel. Thus, as much as I liked these characters and the author’s storytelling, I’m left unsatisfied that the book does not have a real ending.